The American Red Cross, the United States Lifesaving Association, and the YMCA of the USA are pleased to announce the release of the United States Lifeguard Standards: An Evidence-Based Review and Report by the United States Lifeguard Standards Coalition. 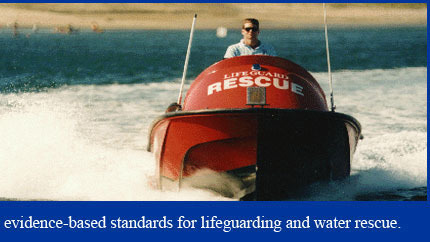 These three organizations intend for the recommendations in the report to have a positive influence on the training of lifeguards and the practice of lifeguarding within their own organizations and, by freely sharing this research information and results, within other lifeguard training organizations as well. We have undergone this process maintaining the principle that best practice in lifeguarding should be based on the best and most scientific evidence available, and that once that evidence is identified, it should be relevant for and apply to all lifeguard training. The sponsors hope that the outcomes are found valuable and that they will contribute to an enhancement in the nation's aquatic safety. Sincere appreciation is extended to the many volunteers and supporting organizations that contributed to the creation of the report. Special thanks to the National Swimming Pool Foundation for its generous financial support of the Coalition's activities. Click on the following to download a copy of the report: United States Lifeguard Standards: An Evidence-Based Review and Report by the United States Lifeguard Standards Coalition.